at Dance New Amsterdam in New York City December 2009. *There will be a post-show discussion on Dec. 10 moderated by Brian Brooks. "...has an integrity that many grander projects don't achieve"
Since 2001, Aynsley Vandenbroucke has been making work that distills movement and performance to a necessary core. In A Number of Small Black and White Dances, she mines and recombines this dance history to create an entirely new piece. Lighting Design by Nelson R. Downend, Jr.
Free Preview: Wednesday, Dec. 12 at 12:15pm in DNA's 2nd floor gallery followed by a brief Q&A. This performance is made possible in part with public funds from the Manhattan Community Arts Fund, supported by the New York City Department of Cultural Affairs and administered by Lower Manhattan Cultural Council. The 92nd Street Y Harkness Dance Center also supported the development of one of these pieces through its Fridays at Noon program. 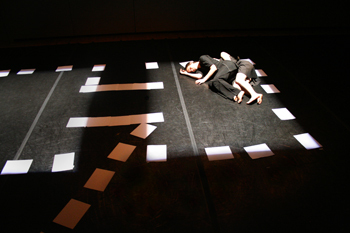 The piece was also supported by Dance Conversations at the Flea and residencies at Mount Tremper Arts.